WHEELS: 17" X 6.5" ALUMINUM (STD), TRANSMISSION: 6-SPEED AUTOMATIC -inc: Autostick Automatic Transmission, Tip Start (STD), TIRES: P215/60R17 BSW AS TOURING (STD), SIRIUS SATELLITE RADIO (subscription required), QUICK ORDER PACKAGE 2GB -inc: Engine: 2.4L I4 DOHC 16V Dual VVT, Transmission: 6-Speed Automatic, Remote Start System, MANUFACTURER'S STATEMENT OF ORIGIN, ENGINE: 2.4L I4 DOHC 16V DUAL VVT (STD), DEEP CHERRY RED CRYSTAL PEARLCOAT, DARK SLATE GRAY, PREMIUM CLOTH BUCKET SEATS, Wheels: 17" x 6.5" Aluminum. 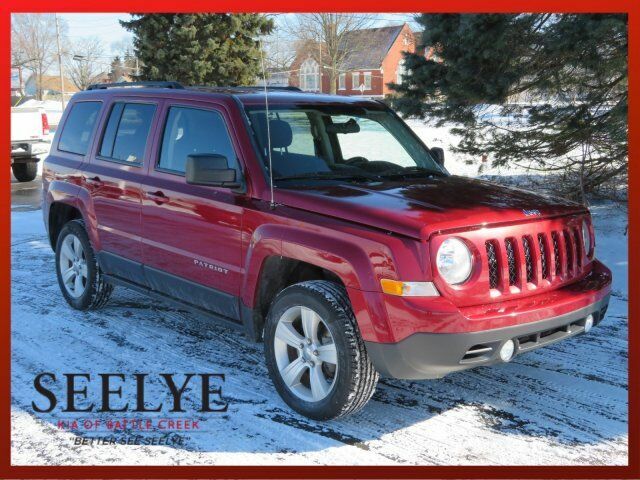 This Jeep Patriot has a powerful Regular Unleaded I-4 2.4 L/144 engine powering this Automatic transmission. Variable Intermittent Wipers, Transmission: 6-Speed Automatic -inc: AutoStick Automatic Transmission, Tip Start, Transmission w/Sequential Shift Control, Touring Suspension, Tires: P215/60R17 BSW AS Touring, Tailgate/Rear Door Lock Included w/Power Door Locks, Strut Front Suspension w/Coil Springs, Steel Spare Wheel, Sliding Front Center Armrest w/Storage, Single Stainless Steel Exhaust, Side Impact Beams, Sentry Key Engine Immobilizer, Roof Rack Rails Only, Remote Keyless Entry w/Integrated Key Transmitter, Illuminated Entry and Panic Button, Rear Cupholder, Rear Child Safety Locks, Radio: Uconnect 130 AM/FM/CD/MP3, Radio w/Clock and Steering Wheel Controls, Premium Cloth Bucket Seats, Power Rear Windows and Fixed 3rd Row Windows. IIHS Top Safety Pick, KBB.com 5-Year Cost to Own Awards, KBB.com 10 Most Affordable SUVs.